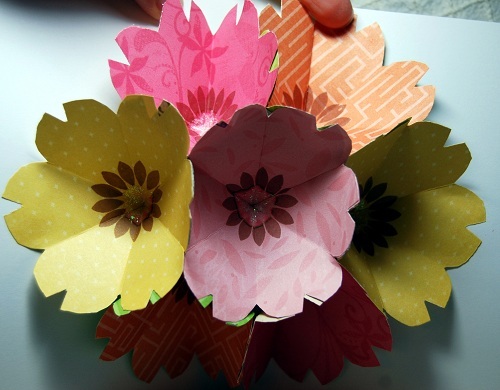 A couple of weeks ago I signed up for the daily craft e-mail from Martha Stewart and in one of the messages there were directions for an oragami flower bouquet card. Can it get any better than combining my favorite things - card and flowers?!? 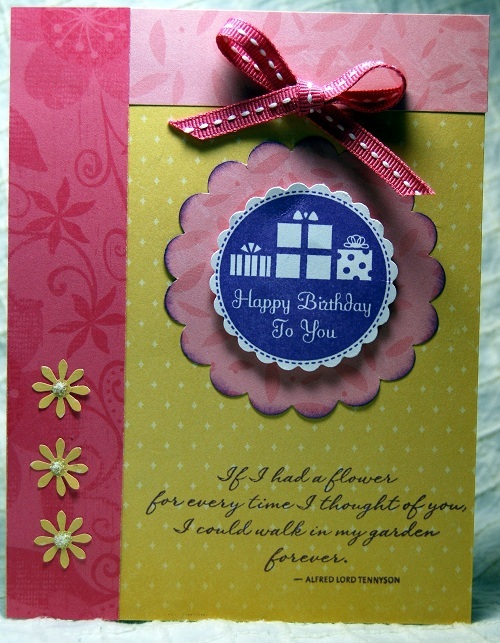 The nice thing about this style of card is that it lets you use up a whole lot of scraps. I went through all my papers looking for pinks, yellows and oranges on the reverse to give the flowers some texture and pop. I really think you need B&T paper for these as cardstock would be way too heavy and not allow you to open them up as effectively. I stamped a flower center from an older set to the center of my squares before folding and trimming and then added a bit of Glitz inside each flower after the card was all assembled. If you follow the link to Martha's directions (at the bottom of this post) then you'll see my petals are a little different - I cut a V out of the tip to give the petals a more defined shape.